A remarkable diversity of bioerosion trace fossils is reflected by the plethora of ichnotaxa that has been proposed for these structures during the past two centuries. Bioerosion traces include microborings, macroborings, grazing traces, attachment etchings, and predation traces. They occur in calcareous, siliceous, osteic, and xylic substrates, and are known or interpreted to be produced by tracemakers as diverse as bacteria, fungi, algae, invertebrates, and vertebrates. This review presents the status quo of an inventory of all bioerosion ichnotaxa currently recognized as valid, comprising 123 ichnogenera and 339 ichnospecies, including 45 combinationes novae, the majority of which on account of fossil sponge bioerosion traces formerly grouped within the sponge biotaxon Cliona. In addition, the spelling of several ichnotaxa has to be corrected, leading to eight nomina corrigenda, and three cases of primary or secondary homonymy require establishing nomina nova, i.e., the new ichnogenus name Irhopalia replacing Rhopalia Radtke, 1991, as well as the new ichnospecies names Entobia morrisi replacing E. glomerata (Morris, 1851) and Entobia tuberculata replacing E. mammillata Bromley and D’Alessandro, 1984, respectively. Ichnotaxa of dubious or invalid nomenclatural status currently include an additional 76 ichnogenera and 157 ichnospecies. The invalid ichnogenus Ipites is herein reinstated as new ichnogenus. Considering that only four valid (and one invalid) ichnofamilies had previously been established for bioerosion ichnotaxa, we here introduce a suite of 14 additional ichnofamilies: Gastrochaenolitidae, Talpinidae, Entobiaidae, Planobulidae, Ichnoreticulinidae, Saccomorphidae, Centrichnidae, Renichnidae, Podichnidae, Gnathichnidae, Circolitidae, Oichnidae, Belichnidae, and Machichnidae. 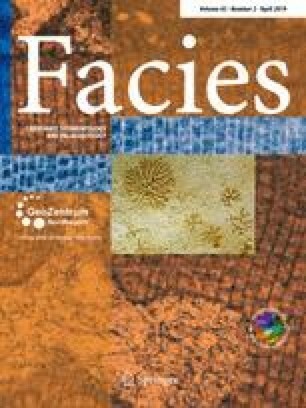 During the past five decades, the number of valid bioerosion ichnotaxa has more than quadrupled, reflecting a boost in bioerosion research, but also indicating the need for ichnotaxonomic consolidation in concert with a revision of key ichnogenera. In this context, the aim of this overview is to call for feedback from the research community in order to foster completeness of this list and to provide ichnotaxonomic stability. Furthermore, we want to raise awareness of the existence of the listed ichnotaxa, many of which obviously have remained unconsidered or forgotten for a long time. This article is part of a Topical Collection in Facies on Bioerosion: An interdisciplinary approach, guest edited by Ricci, Uchman, and Wisshak. We gratefully acknowledge all colleagues from the bioerosion research community who brought overlooked ichnotaxa to our attention and discussed the validity of reputed ichnotaxa with us. These are Jorge Genise (Buenos Aires, Argentina), Kantimati Kulkarni (Agharkar, India), Eduardo Mayoral (Huelva, Spain), Matthew Riley (Cambridge, UK), Andrew Rindsberg (Livingston, USA), Ana Santos (Huelva, Spain), Ursula Toom (Tallinn, Estonia), Alfred Uchman (Krakow, Poland), Mark Wilson (Wooster, USA), and Li-Jun Zhang (Henan, China). We are particularly indebted to Christine Schönberg (Perth, Australia), who, during her ongoing revision of the bioeroding sponge genus Cliona, brought many actual bioerosion ichnospecies to light and to our notice. We thank Sebastian Teichert (Erlangen, Germany) for his valuable advice regarding the validity of Latin, latinized, or Greek spelling of various ichnotaxa and their combinations. Andrew Rindsberg (Livingston, USA) and Radek Mikuláš (Prague, Czech Republic) provided valuable reviews of this manuscript. Last but not least, we are indebted to our dear friend and mentor Richard G. Bromley (1939-2018) for his immense contribution to bioerosion research and ichnotaxonomy.